A group of Syrian refugees has been successfully resettled in the county with two families being re-homed in Rugby. A private flight arrived at Birmingham International Airport earlier this month carrying a number of Syrian families who have now been successfully resettled around the region, including two families in Stratford, Nuneaton and Bedworth, and Rugby. 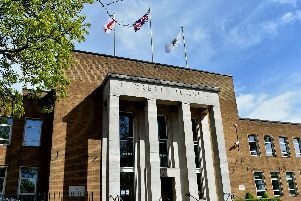 Warwickshire County Council, which has been working with district and borough councils, health groups and the voluntary sector to create a package of support for the families, said the Syrians given sanctuary here are among those who have suffered the most after the humanitarian disaster in their homeland since civil war erupted in 2011. Many have been displaced from their homes or had their houses and livelihoods destroyed in the subsequent conflicts, the council said. There has been an “overwhelming amount of support from local communities” to ensure the process of resettlement has been as smooth as possible, it added. Michael Stokes, the leader of Rugby Borough Council, said: “We have worked with our council colleagues and other statutory agencies across Warwickshire to a fulfil our commitment to support the Government’s humanitarian response to the events in Syria, a commitment which reflected the concerns raised by many residents who contacted the council to urge us to support the Syrian Vulnerable Persons Relocation Scheme. “I am pleased we have this week welcomed the first Syrian families to privately-rented accommodation in Rugby, playing our part in Warwickshire’s support for the relocation scheme. Meanwhile, the Coventry & Warwickshire Mind charity is working with the county council to provide a Befriending and Support Service for refugees arriving in our county. It is now looking for volunteers to welcome and support families to settle into their new communities. Helpers, who will receive training, support and out-of-pocket expenses, will be matched with families. For more details, call Denise Lindsay on 02476 632644 or email denise@cwmind.org.uk.